The Perseids are often the most impressive Meteor Shower of the year for the Northern Hemisphere. The Perseids offers a consistently high rate of meteors every year and it occurs in August when the temperatures are usually nice enough for a night under the stars! Each July and August the Earth encounters debris left behind from comet 109P/Swift-Tuttle. This comet has an orbit of 133 years and last entered the inner solar system in 1992. Even though the comet now lies in the outer portions of the solar system, far away from Earth, we still encounter debris that has been left behind during the many trips this comet has made through the solar system. This meteor shower is perhaps the most popular as it is active during the summer months in the northern hemisphere. There are stronger meteor showers but they appear during the colder time of year in the northern hemisphere when conditions are less inviting. The strength of each Perseid display varies year to year, mainly due to lunar conditions. If a bright moon is above the horizon during the night of maximum activity, then the display will be reduced. Most of the Perseid meteors are faint and bright moonlight will make it difficult to view. Such was the case in 2017 when the bright moon rose near midnight and spoiled the show just when the activity kicked into high gear. We are much more fortunate this year as the moon reaches it new phase on August 11, just two days before the predicted maximum. This means that the very slender crescent moon will set shortly after the end of dusk and will not interfere at all with viewing this year’s display. To view the Perseids at their best, you need to know when to watch. During the evening hours the radiant, the area of the sky where Perseid meteors shoot from, is located low in the northern sky. This is the worst time to try and view the shower for sheer numbers as most of the activity will occur beyond your line of sight. The few that do come your way this time of night are special. The reason is that they just skim the upper regions of the atmosphere and will last much longer than Perseids seen during the morning hours. Since they last longer they also will travel a much longer distance across the sky. Most of these “earthgrazing” Perseids will be seen low in the east or west, traveling north to south. Occasionally one will pass overhead and will be unforgettable as you watch it shoot across the sky for several seconds. While these meteors are few, they are certainly worth the effort to try and catch. As the Earth rotates and the time approaches local midnight, the Perseid radiant has risen higher into the northeastern sky. The meteors are now shorter and last only a few tenths of a second. You still only see about half of the actual activity as the remainder still occur beyond your line of sight. As the morning progresses, the activity will increase as the radiant climbs higher into the sky. Theoretically, the best time to watch the Perseids is just before the break of dawn when the radiant lies highest in a dark sky. This is usually around 04:00 local time. Experienced observers often say the hour between 03:00 and 04:00 is usually the best, not 04:00 to 05:00. Perhaps this is due to fatigue as experienced observers have watched for several hours by then and may have trouble staying alert. The strongest Perseid rates this year are expected to occur on the Sunday night/Monday morning August 12/13, when the Earth closest to the core orbit of comet 109P/Swift-Tuttle. If you cannot observe on that night activity will still be good on Sunday and Tuesday mornings. The further you watch from August 13, the weaker the display will be, especially after maximum activity. To view the Perseids successfully it is suggested you watch from a safe rural area that is as dark as possible. The more stars you can see, the more meteors will also be visible. No matter the time of night, Perseid meteors can be seen in all portions of the sky. No matter which direction you look, it is advisable to aim your center of view about half-way up in the sky. Don’t look straight up as more activity is visible at lower elevations. 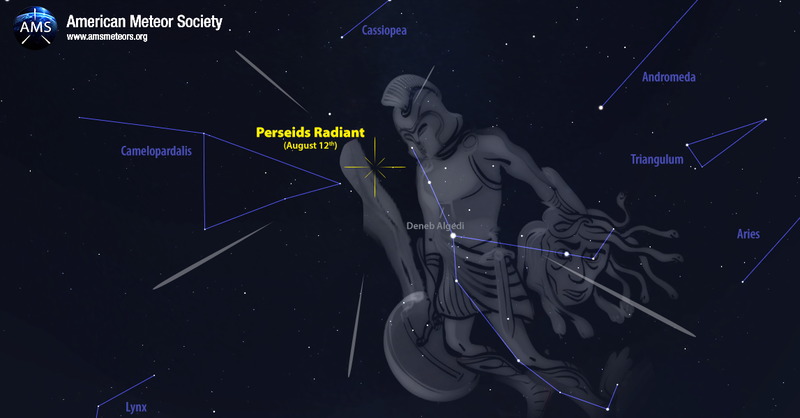 Some observers like to view toward the constellation Perseus and the radiant. This way they can see Perseid meteors travel in all directions. The disadvantage of viewing in this direction is that the Perseid meteors will be short, especially near the radiant. The other choice is to face away from the radiant and witness longer meteors, which are more impressive. Even if the radiant is at your back, you can still distinguish Perseid meteors from others as they will all travel in the same parallel paths and will have similar velocities. While viewing this meteor shower we encourage observers to contribute data to our organization by counting the number of meteors seen during a specific time range and sharing that data with us. A period of at least an hour is suggested as meteor displays are notoriously variable. One can watch for 10 minutes and see no activity at all! Just a few minutes later several meteors may appear nearly simultaneously. To even out these “peaks and valleys” is why we ask for viewing periods of at least an hour. Not all meteors you see will be Perseids. There are other weak showers active during the Perseids plus there are many random meteors that occur each hour too. 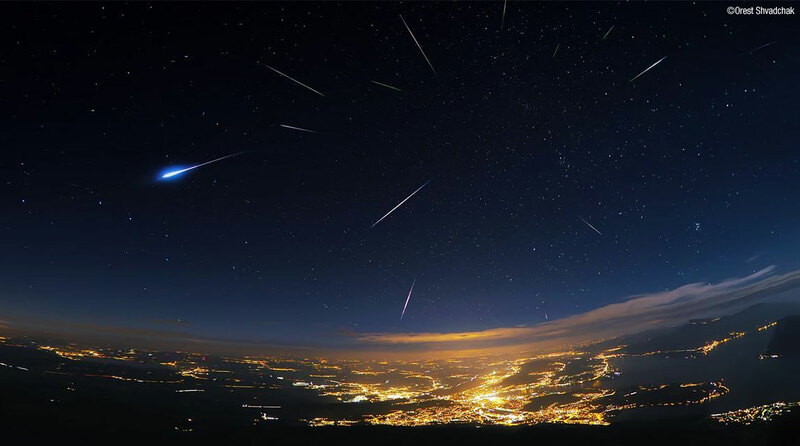 Separating these different meteors adds to the value of your data. It is also important to estimate the faintest star you can easily see by reporting a limiting magnitude. The faintest stars most observers can see from a rural location is around magnitude +6.0. Very dark sites can approach +7.0. Light polluted skies usually offer limiting magnitudes of +5.0 and worse. An estimate of your limiting magnitude will allow us to correct your data to a similar limiting magnitude so that all counts will be compared under similar conditions. Don’t forget to mention any clouds or obstacles that block your field of view. These will reduce your counts. If you are experienced enough, we encourage you to share your observation to the International Meteor Organization. Helpful hints on how to do this are available here. The bottom line is to have fun watching nature’s fireworks. If you can have fun and contribute data too, that helps us understand more about this phenomena. Bob has been interested in the stars as far back as he can recall His first experience with meteors was a biggie, the 1966 Leonid shower. In 1980, a major awaking occurred. He received a sample copy of Meteor News. He was amazed to learn there was a group actually devoted strictly to meteor observing! He joined the group also started to view some of the minor showers list among the pages of Meteor News. Lastly, he was contracted by Springer Publishing in 2007 to write a book on observing meteors. The book is now available and hopefully will be a useful guide to all interested in the enjoyable field of meteor observing. What is the best direction for viewing, besides up. Northeast would be the best direction to face. If that direction is obscured by trees or light look toward the darkest/least obscured direction. Hello, my ship is deployed to the Middle East and I expect that we’ll be underway in the Red Sea on the 12-13th of this month. I want to inform my Shipmates of the best time to go out on deck and observe, so I’d like to ask you if the 3-4 AM peak is still valid here on the other side of the planet from home. Sorry if this is a dumb question, I just don’t want to pull all of my friends out in the wee hours just to miss the show! Yes, the 3-4am time frame is best no matter where you are located. Hi, Thomas. Glad you asked the question. I’m in Israel and was wondering the same thing. Thanks for your service! My daughter and I sawabout 20 last night August 3-4 until it got clouded and we saw about 50 tonight August 4-5 in south central Kansas about 15 minutes southwest of Wichita. Several of them were very length and bright we had a super time. Weve been watching for years, really looking forward to this week. Ok…This is a wildly unrelated question but are you by any chance related to a woman that used to raise/breed toy poodles? 20 years ago I met a couple from Kansas while I was on vacation in Colorado (actually, my husband sideswiped their rental car with our rented camper!) We exchanged Christmas cards and corresponded for a few years and then lost touch. I saw you our name and could not resist asking! Thank you for a great article! Sharing on our Facebook page for our Perseids event! Hi. I’m currently travelling in Bali, Indonesia. Will the Perseid meteor shower be at all visible from here? Thanks! The Perseids will be visible in Bali during the same time frame. The only difference will be that from a lower latitude, the number of meteors will be reduced as the radiant (the area of the sky Perseid meteors shoot from) will not rise as high in the sky. On the positive side, night lasts longer in Bali so you will be able to view a bit longer. It will still be a good show so don’t hesitate to try and witness this celestial spectacle! Is there a particular area in New England area (looking for a specific town in one of the states) that is especially good to view it? Thank you this article was very helpful! I would suggest contacting a local astronomy club. They will know where a safe and dark site is located to view the display. So I have been looking forward to this meteor shower for some time. It appears that the location I plan on viewing them from has a forecast of scattered thunderstorms and being cloudy. The only clear sky this week there is Aug 9th. Would I still have a chance of catching something? Thank you in advance for your feedback. On August 9th the Perseids should produce between 10 and 20 meteors per hour, depending on when you watch and just how dark your skies are. At these rates it’s still definitely worth a try. A bunch of yrs (15?) We could (about 20) counted above 75 per hour. What can we expect this year? ( At peak) and when can we expect numbers approaching or above 75 or 100 or more again ? You may be able to see 75 Perseids per hour during the morning hours of August 13 if your skies are extremely dark and transparent. In 2016, some observers surpassed these rates as Jupiter nudged the orbit a bit closer to the Earth. The next enhanced Perseid rates are due 2026 to 2028. Hello ! What are some great hikes I could go to in San Diego ca to see the stars?? A lot of folks head toward the mountains to view this display. A couple of my favorite spots are the rest stop one mile past Viejas Casino and the numerous pull outs along Sunrise Highway heading to Mt. Laguna. Looks like the weather will be perfect for viewing this weekend! I was wondering where the best place would be to see it in Oregon? The best viewing spots would be anywhere away from city lights. You can contact the nearest astronomical group for more precise advice as I’m certain that they have dark and safe sites that they use. Can’t wait. I will be watching from Del Mar,California. Thank you for your post. This is by far the best site for meteors that I have ever seen. I have shared this to my facebook page to that others can be made aware of this. You state about the Perseids: The further you watch from August 13, the weaker the display will be, especially after maximum activity. Do you know why the Perseids drop so precipitously after the peak? In other words, why do the Perseids build up gradually yet fall off rapidly? Just saw (at around 23:32 EDT, 21 Aug 2018) a very bright, very short, meteor track in the Northeast sky, maybe about 30-40 degrees above my local horizon. The track was roughly from Northnorthwest to Eastsoutheast. My view in that direction is too populated to see any identifiable stars/constellations. Note that this is nearly opposite the now-close-to-setting slightly-larger-than-quarter moon. I am located in Northeast Massachusetts, very close to New Hampshire’s southern border, in the valley of the Merrimac River.